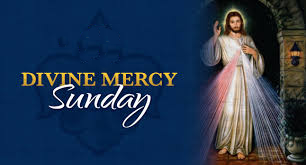 On the occasion of the canonization of St. Faustina, Pope Saint John Paul II directed that Divine Mercy Sunday shall be celebrated on the Octave, the Second Sunday of Easter. We take this time to celebrate God's unbounded love in sacrificing his only begotten son for the sake of our sins. Our Gospel reading this Sunday (John 20:19-31) has two distinct messages. One is the institution of the Sacrament of Reconciliation through the priesthood. Jesus appeared to his Apostles in the upper room and gave them the authority to forgive sins. The other message is a call to faith, which by its very nature is a belief in someone or something we have not yet seen. It is the story of Thomas, the doubter, who demands to touch the wounds of Jesus before he will believe that he is risen. On the evening of that first day of the week, when the doors were locked, where the disciples were, for fear of the Jews, Jesus came and stood in their midst and said to them, "Peace be with you." When he had said this, he showed them his hands and his side. The disciples rejoiced when they saw the Lord. Jesus said to them again, "Peace be with you. As the Father has sent me, so I send you." And when he had said this, he breathed on them and said to them, "Receive the Holy Spirit. Whose sins you forgive are forgiven them, and whose sins you retain are retained." Thomas, called Didymus, one of the Twelve, was not with them when Jesus came. So the other disciples said to him, "We have seen the Lord." But he said to them, "Unless I see the mark of the nails in his hands and put my finger into the nailmarks and put my hand into his side, I will not believe." Our first reading is taken from the Acts of the Apostles (Acts 2:42-47), which is the story of the formation and spread of the early Church. In today's passage, we hear how the early Church came together as one community, working, praying and breaking bread together. They devoted themselves to the teaching of the apostles and to the communal life, to the breaking of bread and to the prayers. Awe came upon everyone, and many wonders and signs were done through the apostles. All who believed were together and had all things in common; they would sell their property and possessions and divide them among all according to each one's need. Every day they devoted themselves to meeting together in the temple area and to breaking bread in their homes. They ate their meals with exultation and sincerity of heart, praising God and enjoying favor with all the people. And every day the Lord added to their number those who were being saved. Our Epistle reading is from the opening of the First Letter of St. Peter (1 PT 1:3-9). This is a letter filled with the joy, faith and hope of the Resurrection. Blessed be the God and Father of our Lord Jesus Christ, who in his great mercy gave us a new birth to a living hope through the resurrection of Jesus Christ from the dead, to an inheritance that is imperishable, undefiled, and unfading, kept in heaven for you who by the power of God are safeguarded through faith, to a salvation that is ready to be revealed in the final time. In this you rejoice, although now for a little while you may have to suffer through various trials, so that the genuineness of your faith, more precious than gold that is perishable even though tested by fire, may prove to be for praise, glory, and honor at the revelation of Jesus Christ. Although you have not seen him you love him; even though you do not see him now yet believe in him, you rejoice with an indescribable and glorious joy, as you attain the goal of your faith, the salvation of your souls. During this fifty-day season of Easter until Pentecost, we get to hear the continuing saga of the development of the early church - the triumphs and the persecutions and we will hear of Jesus' appearances to his disciples after his resurrection and will hear again some of his final words to his disciples just before his passion and death. The Church gives us this time to reflect and pray on "What just happened" in Christ's painful death and glorious resurrection. May we take this opportunity to come to know and love Jesus all the more.